Every pilot is urged to receive a preflight briefing and to file a flight plan. This briefing should consist of the latest or most current weather, airport, and en route NAVAID information. Briefing service may be obtained from an FSS either by telephone or radio when airborne. Pilots within the contiguous U.S. may access Flight Service through www.1800wxbrief.com or by contacting them at 1-800-WX-Brief to obtain preflight weather data and to file IFR and VFR flight plans. Pilots filing flight plans via “fast file” who desire to have their briefing recorded, should include a statement at the end of the recording as to the source of their weather briefing. The information required by the FAA to process flight plans is contained on FAA Form 7233-1, Flight Plan, or FAA Form 7233-4, International Flight Plan. The forms are available at all flight service stations. Additional copies will be provided on request. Consult an FSS for preflight weather briefing. FSSs are required to advise of pertinent NOTAMs if a standard briefing is requested, but if they are overlooked, do not hesitate to remind the specialist that you have not received NOTAM information. NOTAMs, graphic notices, and other information published in the Notices to Airmen Publication (NTAP) are not provided during a briefing unless specifically requested by the pilot since the FSS specialist has no way of knowing whether the pilot has already checked the NTAP prior to calling. Airway NOTAMs, procedural NOTAMs, and NOTAMs that are general in nature and not tied to a specific airport/facility (for example, flight advisories and restrictions, open duration special security instructions, and special flight rules areas) are briefed solely by pilot request. Remember to ask for NOTAMs and graphic notices published in the NTAP if you have not already reviewed this information, and to request all pertinent NOTAMs specific to your flight. Pilots are urged to use only the latest issue of aeronautical charts in planning and conducting flight operations. Aeronautical charts are revised and reissued on a regular scheduled basis to ensure that depicted data are current and reliable. In the conterminous U.S., Sectional Charts are updated every 6 months, IFR En Route Charts every 56 days, and amendments to civil IFR Approach Charts are accomplished on a 56-day cycle with a change notice volume issued on the 28-day midcycle. Charts that have been superseded by those of a more recent date may contain obsolete or incomplete flight information. Type of flight planned; e.g., VFR or IFR. Aircraft's number or pilot's name. Prior to conducting a briefing, briefers are required to have the background information listed above so that they may tailor the briefing to the needs of the proposed flight. The objective is to communicate a “picture” of meteorological and aeronautical information necessary for the conduct of a safe and efficient flight. Briefers use all available weather and aeronautical information to summarize data applicable to the proposed flight. They do not read weather reports and forecasts verbatim unless specifically requested by the pilot. FSS briefers do not provide FDC NOTAM information for special instrument approach procedures unless specifically asked. Pilots authorized by the FAA to use special instrument approach procedures must specifically request FDC NOTAM information for these procedures. Pilots who receive the information electronically will receive NOTAMs for special IAPs automatically. AIM, Paragraph 7-1-5 , Preflight Briefings, contains those items of a weather briefing that should be expected or requested. FAA by 14 CFR Part 93, Subpart K, has designated High Density Traffic Airports (HDTAs) and has prescribed air traffic rules and requirements for operating aircraft (excluding helicopter operations) to and from these airports. In addition to the filing of a flight plan, if the flight will traverse or land in one or more foreign countries, it is particularly important that pilots leave a complete itinerary with someone directly concerned and keep that person advised of the flight's progress. If serious doubt arises as to the safety of the flight, that person should first contact the FSS. Pilots operating under provisions of 14 CFR Part 135 on a domestic flight without having an FAA assigned 3-letter designator, must prefix the normal registration (N) number with the letter “T” on flight plan filing; for example, TN1234B. Obtain a complete preflight and weather briefing. Check the NOTAMs. File a flight plan. This is an excellent low cost insurance policy. The cost is the time it takes to fill it out. The insurance includes the knowledge that someone will be looking for you if you become overdue at your destination. Use the navigation aids. Practice maintaining a good course-keep the needle centered. Maintain a constant altitude which is appropriate for the direction of flight. Estimate en route position times. Make accurate and frequent position reports to the FSSs along your route of flight. Simulated IFR flight is recommended (under the hood); however, pilots are cautioned to review and adhere to the requirements specified in 14 CFR Section 91.109 before and during such flight. When flying VFR at night, in addition to the altitude appropriate for the direction of flight, pilots should maintain an altitude which is at or above the minimum en route altitude as shown on charts. This is especially true in mountainous terrain, where there is usually very little ground reference. Do not depend on your eyes alone to avoid rising unlighted terrain, or even lighted obstructions such as TV towers. Time‐critical aeronautical information which is of either a temporary nature or not sufficiently known in advance to permit publication on aeronautical charts or in other operational publications receives immediate dissemination via the National NOTAM System. NOTAM information is that aeronautical information that could affect a pilot's decision to make a flight. It includes such information as airport or aerodrome primary runway closures, taxiways, ramps, obstructions, communications, airspace, changes in the status of navigational aids, ILSs, radar service availability, and other information essential to planned en route, terminal, or landing operations. NOTAM information is transmitted using standard contractions to reduce transmission time. See TBL 5-1-2 for a listing of the most commonly used contractions. For a complete listing, see FAA JO Order 7340.2, Contractions. NOTAM information is classified into five categories. These are NOTAM (D) or distant, Flight Data Center (FDC) NOTAMs, Pointer NOTAMs, Special Activity Airspace (SAA) NOTAMs, and Military NOTAMs. NOTAM (D) information is disseminated for all navigational facilities that are part of the National Airspace System (NAS), all public use airports, seaplane bases, and heliports listed in the Chart Supplement U.S. The complete file of all NOTAM (D) information is maintained in a computer database at the Weather Message Switching Center (WMSC), located in Atlanta, Georgia. This category of information is distributed automatically via Service A telecommunications system. Air traffic facilities, primarily FSSs, with Service A capability have access to the entire WMSC database of NOTAMs. These NOTAMs remain available via Service A for the duration of their validity or until published. Once published, the NOTAM data is deleted from the system. NOTAM (D) information includes such data as taxiway closures, personnel and equipment near or crossing runways, and airport lighting aids that do not affect instrument approach criteria, such as VASI. All NOTAM Ds must have one of the keywords listed in TBL 5-1-1 as the first part of the text after the location identifier. FDC NOTAMs. On those occasions when it becomes necessary to disseminate information which is regulatory in nature, the National Flight Data Center (NFDC), in Washington, DC, will issue an FDC NOTAM. FDC NOTAMs contain such things as amendments to published IAPs and other current aeronautical charts. They are also used to advertise temporary flight restrictions caused by such things as natural disasters or large‐scale public events that may generate a congestion of air traffic over a site. NOTAM data may not always be current due to the changeable nature of national airspace system components, delays inherent in processing information, and occasional temporary outages of the U.S. NOTAM system. While en route, pilots should contact FSSs and obtain updated information for their route of flight and destination. Pointer NOTAMs. NOTAMs issued by a flight service station to highlight or point out another NOTAM, such as an FDC or NOTAM (D) NOTAM. This type of NOTAM will assist users in cross-referencing important information that may not be found under an airport or NAVAID identifier. Keywords in pointer NOTAMs must match the keywords in the NOTAM that is being pointed out. The keyword in pointer NOTAMs related to Temporary Flight Restrictions (TFR) must be AIRSPACE. SAA NOTAMs. These NOTAMs are issued when Special Activity Airspace will be active outside the published schedule times and when required by the published schedule. Pilots and other users are still responsible to check published schedule times for Special Activity Airspace as well as any NOTAMs for that airspace. Military NOTAMs. NOTAMs pertaining to U.S. Air Force, Army, Marine, and Navy navigational aids/airports that are part of the NAS. Part 1, provided by NFDC, contains Part 95 Revisions, Revisions to Minimum En Route IFR Altitudes and Changeover Points. Section 1, International Flight Prohibitions, Potential Hostile Situations, and Foreign Notices. Section 2, International Oceanic Airspace Notices. Part 3, Graphic Notices, compiled by ATC Products and Publications from data provided by FAA service area offices and other lines of business, contains special notices and graphics pertaining to almost every aspect of aviation such as: military training areas, large scale sporting events, air show information, Special Traffic Management Programs (STMP), and airport­specific information. This part is comprised of 6 sections: General, Special Military Operations, Airport and Facility Notices, Major Sporting and Entertainment Events, Airshows, and Special Notices. DEPARTURE PROCEDURE: RWY 25, CLIMB HEADING 250 TO 3500 BEFORE TURNING LEFT. ALL OTHER DATA REMAINS AS PUBLISHED. CHART NOTE: SIMULTANEOUS APPROACH AUTHORIZED WITH RWY 31L. MISSED APPROACH: CLIMB TO 1000 THEN CLIMBING RIGHT TURN TO 5000 ON HEADING 330 AND CVE R-046 TO FINGR INT/CVE 36.4 DME AND HOLD. CHART LOC RWY 31L. * Unverified Aeronautical Information can be movement area or other information received that meets NOTAM criteria and has not been confirmed by the Airport Manager (AMGR) or their designee. If Flight Service is unable to contact airport management, Flight Service must forward (U) NOTAM information to the United States NOTAM System (USNS). Subsequent to USNS distribution of a (U) NOTAM, Flight Service will inform airport management of the action taken as soon as practical. Any such NOTAM will be prefaced with “(U)” as the keyword and followed by the appropriate keyword contraction, following the location identifier. ** Other Aeronautical Information is that which is received from any authorized source that may be beneficial to aircraft operations and does not meet defined NOTAM criteria. Any such NOTAM will be prefaced with “(O)” as the keyword following the location identifier. Except for operations in or penetrating an ADIZ, a flight plan is not required for VFR flight. It is strongly recommended that a flight plan (for a VFR flight) be filed with an FAA FSS. This will ensure that you receive VFR Search and Rescue Protection. AIM, Paragraph 6-2-6 , Search and Rescue, gives the proper method of filing a VFR flight plan. To obtain maximum benefits from the flight plan program, flight plans should be filed directly with the nearest FSS. For your convenience, FSSs provide aeronautical and meteorological briefings while accepting flight plans. Radio may be used to file if no other means are available. Some states operate aeronautical communications facilities which will accept and forward flight plans to the FSS for further handling. When a “stopover” flight is anticipated, it is recommended that a separate flight plan be filed for each “leg” when the stop is expected to be more than 1 hour duration. The actual departure time is received. A revised proposed departure time is received. At a time of filing, the FSS is informed that the proposed departure time will be met, but actual time cannot be given because of inadequate communications (assumed departures). On pilot's request, at a location having an active tower, the aircraft identification will be forwarded by the tower to the FSS for reporting the actual departure time. This procedure should be avoided at busy airports. Although position reports are not required for VFR flight plans, periodic reports to FAA FSSs along the route are good practice. Such contacts permit significant information to be passed to the transiting aircraft and also serve to check the progress of the flight should it be necessary for any reason to locate the aircraft. Bonanza 314K, over Kingfisher at (time), VFR flight plan, Tulsa to Amarillo. Cherokee 5133J, over Oklahoma City at (time), Shreveport to Denver, no flight plan. Pilots not operating on an IFR flight plan and when in level cruising flight, are cautioned to conform with VFR cruising altitudes appropriate to the direction of flight. When filing VFR flight plans, indicate aircraft equipment capabilities by appending the appropriate suffix to aircraft type in the same manner as that prescribed for IFR flight. Under some circumstances, ATC computer tapes can be useful in constructing the radar history of a downed or crashed aircraft. In each case, knowledge of the aircraft's transponder equipment is necessary in determining whether or not such computer tapes might prove effective. 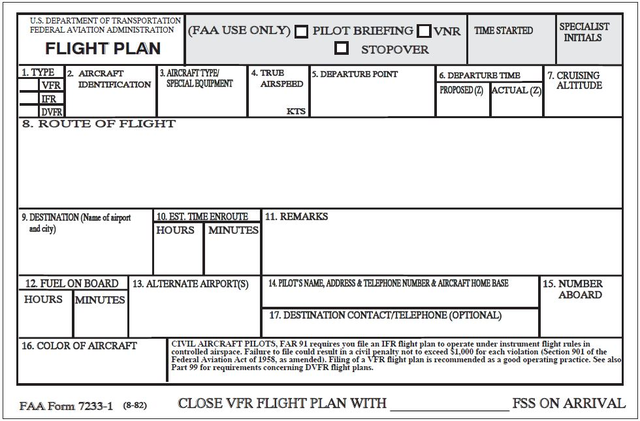 Flight Plan Form - (See FIG 5-1-1). Explanation of VFR Flight Plan Items. Block 1. Check the type flight plan. Check both the VFR and IFR blocks if composite VFR/IFR. Block 2. Enter your complete aircraft identification including the prefix “N” if applicable. Block 3. Enter the designator for the aircraft, or if unknown, consult an FSS briefer. Block 4. Enter your true airspeed (TAS). Block 5. Enter the departure airport identifier code, or if unknown, the name of the airport. Block 6. Enter the proposed departure time in Coordinated Universal Time (UTC) (Z). If airborne, specify the actual or proposed departure time as appropriate. Block 7. Enter the appropriate VFR altitude (to assist the briefer in providing weather and wind information). Block 8. Define the route of flight by using NAVAID identifier codes and airways. Block 9. Enter the destination airport identifier code, or if unknown, the airport name. Include the city name (or even the state name) if needed for clarity. Block 10. Enter your estimated time en route in hours and minutes. Block 11. 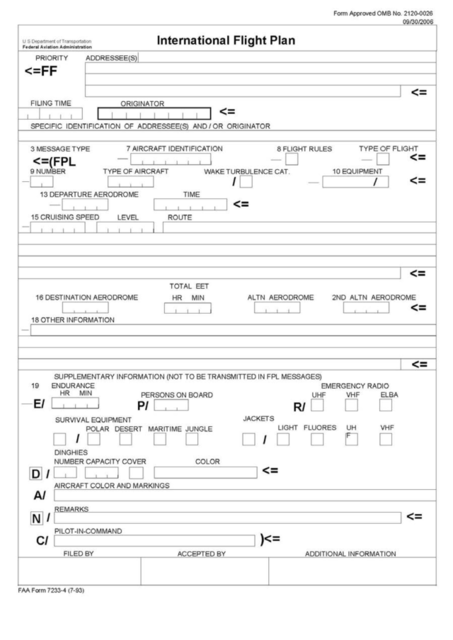 Enter only those remarks that may aid in VFR search and rescue, such as planned stops en route or student cross country, or remarks pertinent to the clarification of other flight plan information, such as the radiotelephony (call sign) associated with a designator filed in Block 2, if the radiotelephony is new, has changed within the last 60 days, or is a special FAA-assigned temporary radiotelephony. Items of a personal nature are not accepted. Block 12. Specify the fuel on board in hours and minutes. Block 13. Specify an alternate airport if desired. Block 14. Enter your complete name, address, and telephone number. Enter sufficient information to identify home base, airport, or operator. This information is essential in the event of search and rescue operations. Block 15. Enter total number of persons on board (POB) including crew. Block 16. Enter the predominant colors. Block 17. Record the FSS name for closing the flight plan. If the flight plan is closed with a different FSS or facility, state the recorded FSS name that would normally have closed your flight plan. Optional- record a destination telephone number to assist search and rescue contact should you fail to report or cancel your flight plan within 1/2 hour after your estimated time of arrival (ETA). The information transmitted to the destination FSS will consist only of flight plan blocks 2, 3, 9, and 10. Estimated time en route (ETE) will be converted to the correct ETA. The FAA's Air Traffic Control System Command Center (ATCSCC) maintains a website with near real-time National Airspace System (NAS) status information. NAS operators are encouraged to access the website at http://www.fly.faa.gov prior to filing their flight plan. The website consolidates information from advisories. An advisory is a message that is disseminated electronically by the ATCSCC that contains information pertinent to the NAS. Facility Outages and Scheduled Facility Outages. This list is not all-inclusive. Any time there is information that may be beneficial to a large number of people, an advisory may be sent. Additionally, there may be times when an advisory is not sent due to workload or the short length of time of the activity. Route information is available on the website and in specific advisories. Some route information, subject to the 56-day publishing cycle, is located on the “OIS” under “Products,” Route Management Tool (RMT), and “What's New” Playbook. The RMT and Playbook contain routings for use by Air Traffic and NAS operators when they are coordinated “real-time” and are then published in an ATCSCC advisory. Route advisories are identified by the word “Route” in the header; the associated action is required (RQD), recommended (RMD), planned (PLN), or for your information (FYI). Operators are expected to file flight plans consistent with the Route RQD advisories. Electronic System Impact Reports are on the intranet at http://www.atcscc.faa.gov/ois/ under “System Impact Reports." This page lists scheduled outages/events/projects that significantly impact the NAS; for example, runway closures, air shows, and construction projects. Information includes anticipated delays and traffic management initiatives (TMI) that may be implemented. Flight plans which specify VFR operation for one portion of a flight, and IFR for another portion, will be accepted by the FSS at the point of departure. If VFR flight is conducted for the first portion of the flight, pilots should report their departure time to the FSS with whom the VFR/IFR flight plan was filed; and, subsequently, close the VFR portion and request ATC clearance from the FSS nearest the point at which change from VFR to IFR is proposed. Regardless of the type facility you are communicating with (FSS, center, or tower), it is the pilot's responsibility to request that facility to “CLOSE VFR FLIGHT PLAN.” The pilot must remain in VFR weather conditions until operating in accordance with the IFR clearance. When a flight plan indicates IFR for the first portion of flight and VFR for the latter portion, the pilot will normally be cleared to the point at which the change is proposed. After reporting over the clearance limit and not desiring further IFR clearance, the pilot should advise ATC to cancel the IFR portion of the flight plan. Then, the pilot should contact the nearest FSS to activate the VFR portion of the flight plan. If the pilot desires to continue the IFR flight plan beyond the clearance limit, the pilot should contact ATC at least 5 minutes prior to the clearance limit and request further IFR clearance. If the requested clearance is not received prior to reaching the clearance limit fix, the pilot will be expected to enter into a standard holding pattern on the radial or course to the fix unless a holding pattern for the clearance limit fix is depicted on a U.S. Government or commercially produced (meeting FAA requirements) low or high altitude enroute, area or STAR chart. In this case the pilot will hold according to the depicted pattern. Procedures outlined in this section apply to operators filing FAA Form 7233-1 (Flight Plan) and to flights that will be conducted entirely within U.S. domestic airspace. Filers utilizing FAA Form 7233-1 may not be eligible for assignment of RNAV SIDs and STARs. Filers desiring assignment of these procedures should file using FAA Form 7233-4 (International Flight Plan), as described in paragraph 5-1-9. Prior to departure from within, or prior to entering controlled airspace, a pilot must submit a complete flight plan and receive an air traffic clearance, if weather conditions are below VFR minimums. Instrument flight plans may be submitted to the nearest FSS or ATCT either in person or by telephone (or by radio if no other means are available). Pilots should file IFR flight plans at least 30 minutes prior to estimated time of departure to preclude possible delay in receiving a departure clearance from ATC. In order to provide FAA traffic management units strategic route planning capabilities, nonscheduled operators conducting IFR operations above FL 230 are requested to voluntarily file IFR flight plans at least 4 hours prior to estimated time of departure (ETD). To minimize your delay in entering Class B, Class C, Class D, and Class E surface areas at destination when IFR weather conditions exist or are forecast at that airport, an IFR flight plan should be filed before departure. Otherwise, a 30 minute delay is not unusual in receiving an ATC clearance because of time spent in processing flight plan data. Traffic saturation frequently prevents control personnel from accepting flight plans by radio. In such cases, the pilot is advised to contact the nearest FSS for the purpose of filing the flight plan. There are several methods of obtaining IFR clearances at nontower, non-FSS, and outlying airports. The procedure may vary due to geographical features, weather conditions, and the complexity of the ATC system. To determine the most effective means of receiving an IFR clearance, pilots should ask the nearest FSS the most appropriate means of obtaining the IFR clearance. When requesting an IFR clearance, it is highly recommended that the departure airport be identified by stating the city name and state and/or the airport location identifier in order to clarify to ATC the exact location of the intended airport of departure. When filing an IFR flight plan, include as a prefix to the aircraft type, the number of aircraft when more than one and/or heavy aircraft indicator “H/” if appropriate. When filing an IFR flight plan, identify the equipment capability by adding a suffix, preceded by a slant, to the AIRCRAFT TYPE, as shown in TBL 5-1-3, Aircraft Suffixes. ATC issues clearances based on filed suffixes. Pilots should determine the appropriate suffix based upon desired services and/or routing. For example, if a desired route/procedure requires GPS, a pilot should file /G even if the aircraft also qualifies for other suffixes. For procedures requiring GPS, if the navigation system does not automatically alert the flight crew of a loss of GPS, the operator must develop procedures to verify correct GPS operation. The suffix is not to be added to the aircraft identification or be transmitted by radio as part of the aircraft identification. It is recommended that pilots file the maximum transponder or navigation capability of their aircraft in the equipment suffix. This will provide ATC with the necessary information to utilize all facets of navigational equipment and transponder capabilities available. When filing an IFR flight plan via telephone or radio, it is highly recommended that the departure airport be clearly identified by stating the city name and state and/or airport location identifier. With cell phone use and flight service specialists covering larger areas of the country, clearly identifying the departure airport can prevent confusing your airport of departure with those of identical or similar names in other states. It is vitally important that the route of flight be accurately and completely described in the flight plan. To simplify definition of the proposed route, and to facilitate ATC, pilots are requested to file via airways or jet routes established for use at the altitude or flight level planned. If flight is to be conducted via designated airways or jet routes, describe the route by indicating the type and number designators of the airway(s) or jet route(s) requested. If more than one airway or jet route is to be used, clearly indicate points of transition. If the transition is made at an unnamed intersection, show the next succeeding NAVAID or named intersection on the intended route and the complete route from that point. Reporting points may be identified by using authorized name/code as depicted on appropriate aeronautical charts. The following two examples illustrate the need to specify the transition point when two routes share more than one transition fix. Spelled out: from Albany, New York, via Jet Route 37 transitioning to Jet Route 14 at BUMPY intersection, thence via Jet Route 14 to Birmingham, Alabama. Spelled out: from Albany, New York, via Jet Route 37 transitioning to Jet Route 14 at Smyrna VORTAC (ENO) thence via Jet Route 14 to Birmingham, Alabama. The route of flight may also be described by naming the reporting points or NAVAIDs over which the flight will pass, provided the points named are established for use at the altitude or flight level planned. Spelled out: from Baltimore‐Washington International, via Victor 44 to Swann intersection, transitioning to Victor 433 at Swann, thence via Victor 433 to Dupont. When the route of flight is defined by named reporting points, whether alone or in combination with airways or jet routes, and the navigational aids (VOR, VORTAC, TACAN, NDB) to be used for the flight are a combination of different types of aids, enough information should be included to clearly indicate the route requested. Spelled out: from Los Angeles International via Jet Route 5 Lakeview, Jet Route 3 Spokane, direct Cranbrook, British Columbia VOR/DME, Flight Level 330 Jet Route 500 to Langruth, Manitoba VORTAC, Jet Route 515 to Winnepeg, Manitoba. When filing IFR, it is to the pilot's advantage to file a preferred route. Preferred IFR Routes are described and tabulated in the Chart Supplement U.S.
ATC may issue a SID or a STAR, as appropriate. All or any portions of the route which will not be flown on the radials or courses of established airways or routes, such as direct route flights, must be defined by indicating the radio fixes over which the flight will pass. Fixes selected to define the route must be those over which the position of the aircraft can be accurately determined. Such fixes automatically become compulsory reporting points for the flight, unless advised otherwise by ATC. Only those navigational aids established for use in a particular structure; i.e., in the low or high structures, may be used to define the en route phase of a direct flight within that altitude structure. Operations above FL 450 - Use aids not more than 200 NM apart. These aids are depicted on enroute high altitude charts. Operation off established routes from 18,000 feet MSL to FL 450 - Use aids not more than 260 NM apart. These aids are depicted on enroute high altitude charts. Operation off established airways below 18,000 feet MSL - Use aids not more than 80 NM apart. These aids are depicted on enroute low altitude charts. Operation off established airways between 14,500 feet MSL and 17,999 feet MSL in the conterminous U.S. - (H) facilities not more than 200 NM apart may be used. Airway or jet route numbers, appropriate to the stratum in which operation will be conducted, may also be included to describe portions of the route to be flown. Spelled out: from Chicago Midway Airport via Victor 262 to Bradford, Victor 10 to Burlington, Iowa, direct St. Joseph, Missouri, direct Salina, Kansas, direct Garden City, Kansas. When route of flight is described by radio fixes, the pilot will be expected to fly a direct course between the points named. Pilots are reminded that they are responsible for adhering to obstruction clearance requirements on those segments of direct routes that are outside of controlled airspace. The MEAs and other altitudes shown on low altitude IFR enroute charts pertain to those route segments within controlled airspace, and those altitudes may not meet obstruction clearance criteria when operating off those routes. Except for GNSS-equipped aircraft, random impromptu routes can only be approved in a radar environment. A random impromptu route is a direct course initiated by ATC or requested by the pilot during flight. Aircraft are cleared from their present position to a NAVAID, waypoint, fix, or airport. Factors that will be considered by ATC in approving random impromptu routes include the capability to provide radar monitoring and compatibility with traffic volume and flow. ATC will radar monitor each flight; however, navigation on the random impromptu route is the responsibility of the pilot. GNSS-equipped aircraft are allowed to operate in a non-radar environment when the aircraft is cleared via, or is reported to be established on, a point-to-point route. The points must be published NAVAIDs, waypoints, fixes, or airports recallable from the aircraft's database. The distance between the points cannot exceed 500 miles and navigational assistance will not be provided. Pilots of aircraft equipped with approved area navigation equipment may file for RNAV routes throughout the National Airspace System and may be filed for in accordance with the following procedures. File the appropriate aircraft equipment suffix in the flight plan. Plan the random route portion of the flight plan to begin and end over appropriate arrival and departure transition fixes or appropriate navigation aids for the altitude stratum within which the flight will be conducted. The use of normal preferred departure and arrival routes (DP/STAR), where established, is recommended. File route structure transitions to and from the random route portion of the flight. Define the random route by waypoints. File route description waypoints by using degree‐ distance fixes based on navigational aids which are appropriate for the altitude stratum. File a minimum of one route description waypoint for each ARTCC through whose area the random route will be flown. File an additional route description waypoint for each turnpoint in the route. Plan additional route description waypoints as required to ensure accurate navigation via the filed route of flight. Navigation is the pilot's responsibility unless ATC assistance is requested. Plan the route of flight so as to avoid prohibited and restricted airspace by 3 NM unless permission has been obtained to operate in that airspace and the appropriate ATC facilities are advised. To be approved for use in the National Airspace System, RNAV equipment must meet system availability, accuracy, and airworthiness standards. For additional information and guidance on RNAV equipment requirements, see Advisory Circular (AC) 20-138, Airworthiness Approval of Positioning and Navigation Systems, and AC 90-100, U.S. Terminal and En Route Area Navigation (RNAV) Operations. Pilots of aircraft equipped with latitude/longitude coordinate navigation capability, independent of VOR/TACAN references, may file for random RNAV routes at and above FL 390 within the conterminous U.S. using the following procedures. File airport‐to‐airport flight plans prior to departure. File the appropriate RNAV capability certification suffix in the flight plan. Plan the random route portion of the flight to begin and end over published departure/arrival transition fixes or appropriate navigation aids for airports without published transition procedures. The use of preferred departure and arrival routes, such as DP and STAR where established, is recommended. Plan the route of flight so as to avoid prohibited and restricted airspace by 3 NM unless permission has been obtained to operate in that airspace and the appropriate ATC facility is advised. Define the route of flight after the departure fix, including each intermediate fix (turnpoint) and the arrival fix for the destination airport in terms of latitude/longitude coordinates plotted to the nearest minute or in terms of Navigation Reference System (NRS) waypoints. For latitude/longitude filing the arrival fix must be identified by both the latitude/longitude coordinates and a fix identifier. 2 Transition fix (pitch point). 5 Los Angeles ARTCC waypoint (catch point). Record latitude/longitude coordinates by four figures describing latitude in degrees and minutes followed by a solidus and five figures describing longitude in degrees and minutes. File at FL 390 or above for the random RNAV portion of the flight. Fly all routes/route segments on Great Circle tracks or GPS-based tracks. Make any inflight requests for random RNAV clearances or route amendments to an en route ATC facility. 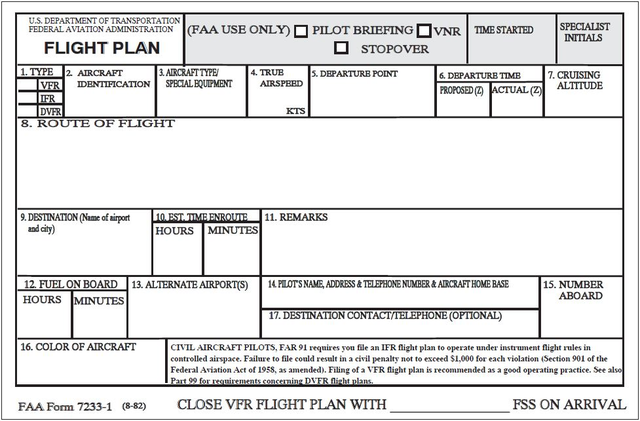 Flight Plan Form- See FIG 5-1-2. Explanation of IFR Flight Plan Items. Block 3. Enter the designator for the aircraft, followed by a slant(/), and the transponder or DME equipment code letter; e.g., C-182/U. Heavy aircraft, add prefix “H” to aircraft type; example: H/DC10/U. Consult an FSS briefer for any unknown elements. Block 4. Enter your computed true airspeed (TAS). If the average TAS changes plus or minus 5 percent or 10 knots, whichever is greater, advise ATC. Block 5. Enter the departure airport identifier code (or the airport name, city and state, if the identifier is unknown). Use of identifier codes will expedite the processing of your flight plan. Block 6. Enter the proposed departure time in Coordinated Universal Time (UTC) (Z). If airborne, specify the actual or proposed departure time as appropriate. Block 7. Enter the requested en route altitude or flight level. Enter only the initial requested altitude in this block. When more than one IFR altitude or flight level is desired along the route of flight, it is best to make a subsequent request direct to the controller. Block 8. Define the route of flight by using NAVAID identifier codes (or names if the code is unknown), airways, jet routes, and waypoints (for RNAV). Use NAVAIDs or waypoints to define direct routes and radials/bearings to define other unpublished routes. Block 9. Enter the destination airport identifier code (or name if the identifier is unknown). Block 10. Enter your estimated time en route based on latest forecast winds. Block 11. Enter only those remarks pertinent to ATC or to the clarification of other flight plan information, such as the appropriate radiotelephony (call sign) associated with the FAA-assigned three-letter company designator filed in Block 2, if the radiotelephony is new or has changed within the last 60 days. In cases where there is no three-letter designator but only an assigned radiotelephony or an assigned three-letter designator is used in a medical emergency, the radiotelephony must be included in the remarks field. Items of a personal nature are not accepted. The pilot is responsible for knowing when it is appropriate to file the radiotelephony in remarks under the 60-day rule or when using FAA special radiotelephony assignments. “DVRSN” should be placed in Block 11 only if the pilot/company is requesting priority handling to their original destination from ATC as a result of a diversion as defined in the Pilot/Controller Glossary. Do not assume that remarks will be automatically transmitted to every controller. Specific ATC or en route requests should be made directly to the appropriate controller. Block 12. Specify the fuel on board, computed from the departure point. Block 13. Specify an alternate airport if desired or required, but do not include routing to the alternate airport. Block 14. Enter the complete name, address, and telephone number of pilot‐in‐command, or in the case of a formation flight, the formation commander. Enter sufficient information to identify home base, airport, or operator. This information would be essential in the event of search and rescue operation. Block 15. Enter the total number of persons on board including crew. Close IFR flight plans with tower, approach control, or ARTCC, or if unable, with FSS. When landing at an airport with a functioning control tower, IFR flight plans are automatically canceled. The information transmitted to the ARTCC for IFR flight plans will consist of only flight plan blocks 2, 3, 4, 5, 6, 7, 8, 9, 10, and 11. Recommended for domestic IFR flights. Filers utilizing FAA Form 7233-1 (Flight Plan) may not be eligible for assignment of RNAV SIDs and STARs. Filers desiring assignment of these procedures should file using FAA Form 7233-4, as described in this section. When filing an IFR flight plan using FAA Form 7233-4, it is recommended that filers include all operable navigation, communication, and surveillance equipment capabilities by adding appropriate equipment qualifiers as shown in Tables 5-1-3 and 5-1-4. These equipment qualifiers should be filed in Item 10 of FAA Form 7233-4. ATC issues clearances based on aircraft capabilities filed in Items 10 and 18 of FAA Form 7233-4. Operators should file all capabilities for which the aircraft and crew is certified, capable, and authorized. PBN/ capability should be filed as per paragraph 5-1-9 b 8 Items 18 (c) and (d). Procedures and other information provided in this section are designed to assist operators using FAA Form 7233-4 to file IFR flight plans for flights that will be conducted entirely within U.S. domestic airspace. Requirements and procedures for operating outside U.S. domestic airspace may vary significantly from country to country. It is, therefore, recommended that operators planning flights outside U.S. domestic airspace become familiar with applicable international documents, including Aeronautical Information Publications (AIP); and ICAO Document 4444, Procedures for Air Navigation Services/Air Traffic Management, Appendix 2. 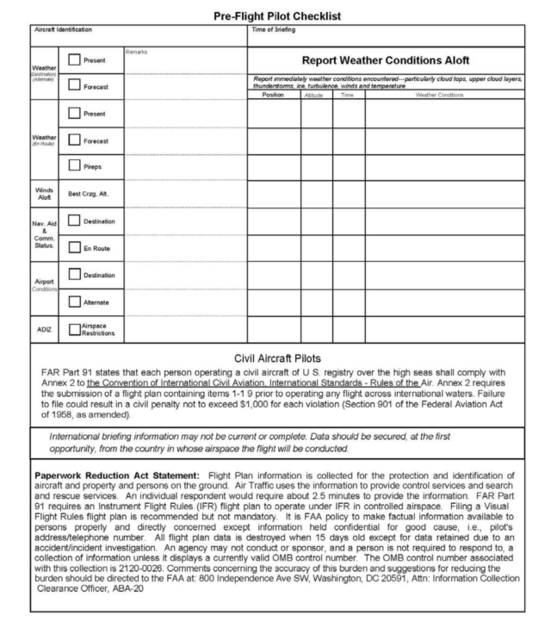 FAA Form 7233-4 is shown in FIG 5-1-3. The filer is normally responsible for providing the information required in Items 3 through 19. Item 7. Aircraft Identification. Insert the full registration number of the aircraft, or the approved FAA/ICAO company or organizational designator, followed by the flight number. Callsigns filed in this item must begin with a letter followed by 1-6 additional alphanumeric characters. Item 8. Flight Rules and Type of Flight. X if other than any of the defined categories above. Type of flight is optional for flights that will be conducted entirely within U.S. domestic airspace. Item 9. Number, Type of Aircraft, and Wake Turbulence Category. Number. Insert the number of aircraft, if more than 1 (maximum 99). Insert ZZZZ, and specify in Item 18, the (numbers and) type(s) of aircraft preceded by TYP/. L — LIGHT, to indicate an aircraft type with a maximum certificated takeoff weight of 15,500 pounds (7,000 kg) or less. a. Presence of relevant serviceable equipment on board the aircraft. b. Equipment and capabilities commensurate with flight crew qualifications. c. Where applicable, authorization from the appropriate authority. If the letter S is used, standard equipment is considered to be VHF RTF, VOR, and ILS within U.S. domestic airspace. If the letter G is used, the types of external GNSS augmentation, if any, are specified in Item 18 following the indicator NAV/ and separated by a space. See RTCA/EUROCAE Interoperability Requirements Standard For ATN Baseline 1 (ATN B1 INTEROP Standard – DO-280B/ED-110B) for data link services air traffic control clearance and information/air traffic control communications management/air traffic control microphone check. If the letter R is used, the performance-based navigation levels that are authorized must be specified in Item 18 following the indicator PBN/. For further details, see Paragraph 5-1-9 b 8, Item 18 (c) and (d). If the letter Z is used, specify in Item 18 the other equipment carried, preceded by COM/, DAT/, and/or NAV/, as appropriate. Information on navigation capability is provided to ATC for clearance and routing purposes. Guidance on the application of performance-based communication, which prescribes RCP to an air traffic service in a specific area, is contained in the Performance-Based Communication and Surveillance (PBCS) Manual (Doc 9869). Enhanced surveillance capability is the ability of the aircraft to down-link aircraft derived data via a Mode S transponder. File no more than one code for each type of capability; for example, file B1 or B2,but not both. ICAO location indicators must consist of 4 letters. Airport identifiers such as 5IA7, 39LL and Z40 are not in ICAO standard format. Then, without a space, insert the estimated off-block time. Cruise Speed (maximum 5 characters). Insert the true airspeed for the first or the whole cruising portion of the flight, in terms of knots, expressed as N followed by 4 digits (e.g. N0485), or Mach number to the nearest hundredth of unit Mach, expressed as M followed by 3 digits (for example, M082). Cruising level (maximum 5 characters). Insert the planned cruising level for the first or the whole portion of the route to be flown, in terms of flight level, expressed as F followed by 3 figures (for example, F180; F330), or altitude in hundreds of feet, expressed as A followed by 3 figures (for example, A040; A170). Route. Insert the requested route of flight in accordance with guidance below. Speed and/or altitude changes en route will be accepted by FAA computer systems, but will not be processed or forwarded to controllers. Pilots are expected to maintain the last assigned altitude and request revised altitude clearances directly from ATC. Consecutive fixes, navaids and waypoints should be separated by the characters “DCT”, meaning direct. IRW125023 identifies the fix located on the Will Rogers VORTAC 125 radial at 23 DME. Combinations of published routes, and fixes, navaids or waypoints should be separated by a single space. Although it is recommended that filed airway junctions be identified using a named junction fix when possible, there may be cases where it is necessary to file junctioning airways without a named fix. In these cases, separate consecutive airways with a space. This method of filing an airway junction may result in a processing ambiguity. This might cause the flight plan to be rejected in some cases. Destination Aerodrome and Total Estimated Elapsed Time (EET). Then, without a space, insert the total estimated time en route to the destination. Alternate and 2nd Alternate Aerodrome (Optional). Insert ZZZZ and specify the name of the aerodrome in Item 18, following the characters ALTN/. Although alternate airport information filed in an FPL will be accepted by air traffic computer systems, it will not be presented to controllers. If diversion to an alternate airport becomes necessary, pilots are expected to notify ATC and request an amended clearance. Operators are warned that the use of indicators not included in the provisions may result in data being rejected, processed incorrectly, or lost. Hyphens “-” or oblique strokes “/” should only be used as described. Avoid use of any other special characters in Field 18 information- use only letters and numbers. An indicator without any associated information will result in flight plan rejection. ALTRV: For a flight operated in accordance with an altitude reservation. ATFMX: For a flight approved for exemption from ATFM measures by the appropriate ATS authority. FLTCK: Flight check for calibration of navaids. HAZMAT: For a flight carrying hazardous material. HEAD: A flight with Head of State status. HOSP: For a medical flight declared by medical authorities. HUM: For a flight operating on a humanitarian mission. MARSA: For a flight for which a military entity assumes responsibility for separation of military aircraft. MEDEVAC: For a life critical medical emergency evacuation. NONRVSM: For a non-RVSM capable flight intending to operate in RVSM airspace. SAR: For a flight engaged in a search and rescue mission. STATE: For a flight engaged in military, customs, or police services. Other reasons for special handling by ATS are denoted under the designator RMK/. PBN/ Indication of RNAV and/or RNP capabilities. Include as many of the descriptors below as apply to the flight, up to a maximum of 8 entries; that is a total of not more than 16 characters. Combinations of alphanumeric characters not indicated above are reserved. NAV/ Significant data related to navigation equipment, other than as specified in PBN/. To be assigned an RNAV 1 SID, insert the characters “D1”. To be assigned an RNAV 1 STAR, insert the characters “A1”. To be assigned en route extensions and/or RNAV PTP, insert the characters “E2”. To prevent assignment of an RNAV route or procedure, insert a numeric value of “0” for the segment of the flight. Alternatively, you may simply remove the segment of the flight indicator and numeric value from the character string. Route assignments are predicated on NAV/ data over PBN/ data in ERAS. Aircraft certification requirements for RNAV operations within U.S. airspace are defined in AC 20-138, Airworthiness Approval of Positioning and Navigation Systems, and AC 90-100, U.S. Terminal and En Route Area Navigation (RNAV) Operations. Operators should file their maximum capabilities in order to qualify for the most advanced procedures. COM/ Indicate communications capabilities not specified in Item 10a, when requested by an air navigation service provider. DAT/ Indicate data applications or capabilities not specified in Item 10a, when requested by an Air Navigation Service Provider. SUR/ Indicate surveillance capabilities not specified in Item 10b, when requested by an Air Navigation Service Provider. If ADS-B capability filed in Item 10 is compliant with RTCA DO-260B, include the item “260B” in SUR/. If ADS-B capability filed in Item 10 is compliant with RTCA DO-282B, include the item “282B” in SUR/. DEP/ Insert the non-ICAO identifier, or fix/radial/distance from navaid, or latitude/longitude, if ZZZZ is inserted in Item 13. Optionally, append the name of the departure point. DEST/ Insert the non-ICAO identifier, or fix/radial/distance from navaid, or latitude/longitude, if ZZZZ is inserted in Item 16. Optionally, append the name of the destination point. DOF/ The date of flight departure in a six figure format (YYMMDD, where YY equals the year, MM equals the month, and DD equals the day). The FAA will not accept flight plans filed with Date of Flight resulting in more than a day in advance. REG/ The registration markings of the aircraft, if different from the aircraft identification in Item 7. Note that the FAA uses this information in monitoring of RVSM and ADS-B performance. EET/ Significant points or FIR boundary designators and accumulated estimated elapsed times to such points or FIR boundaries. TYP/ Insert the type of aircraft if ZZZZ was entered in Item 9. If necessary, insert the number and type(s) of aircraft in a formation. CODE/ Aircraft address (expressed in the form of an alphanumerical code of six hexadecimal characters) when required by the appropriate ATS authority. Include CODE/ when ADS-B capability is filed in Item 10. “F00001” is the lowest aircraft address contained in the specific block administered by ICAO. DLE/ En route delay or holding, insert the significant point(s) on the route where a delay is planned to occur, followed by the length of delay using four figure time in hours and minutes (hhmm). OPR/ Name of the operator, if not obvious from the aircraft identification in Item 7. ORGN/ The originator's 8-letter AFTN address or other appropriate contact details, in cases where the originator of the flight plan may not be readily identified, as required by the appropriate ATS authority. The FAA does not require ORGN/ information. In some areas, flight plan reception centers may insert the ORGN/ identifier and originator's AFTN address automatically. PER/ Aircraft performance data, indicated by a single letter as specified in the Procedures for Air Navigation Services - Aircraft Operations (PANS-OPS, Doc 8168), Volume I - Flight Procedures, if so prescribed by the appropriate ATS authority. Note that the FAA does not require PER/ information. ALTN/ Name of destination alternate aerodrome(s), if ZZZZ is inserted in Item 16. RALT/ ICAO 4-letter indicator(s) for en-route alternate(s), as specified in Doc 7910, Location Indicators, or name(s) of en-route alternate aerodrome(s), if no indicator is allocated. For aerodromes not listed in the relevant Aeronautical Information Publication, indicate location in LAT/LONG or bearing and distance from the nearest significant point, as described in DEP/ above. TALT/ ICAO 4-letter indicator(s) for take-off alternate, as specified in Doc 7910, Location Indicators, or name of take-off alternate aerodrome, if no indicator is allocated. For aerodromes not listed in the relevant Aeronautical Information Publication, indicate location in LAT/LONG or bearing and distance from the nearest significant point, as described in DEP/ above. RIF/ The route details to the revised destination aerodrome, followed by the ICAO four-letter location indicator of the aerodrome. The revised route is subject to reclearance in flight. RMK/ Any other plain-language remarks when required by the ATC or deemed necessary. RVR/ The minimum RVR requirement of the flight in meters. This item is defined by Eurocontrol, not ICAO. The FAA does not require or use this item, but will accept it in a flight plan. This provision is detailed in the European Regional Supplementary Procedures (EUR SUPPs, Doc 7030), Chapter 2. RFP/ Q followed by a digit to indicate the sequence of the replacement flight plan being submitted. This item is defined by Eurocontrol, not ICAO. The FAA will not use this item, but will accept it in a flight plan. Item 19 data must be included when completing FAA Form 7233-4. This information will be retained by the facility/organization that transmits the flight plan to Air Traffic Control (ATC), for Search and Rescue purposes, but it will not be transmitted to ATC as part of the FPL. E/ (ENDURANCE). Insert 4-digits group giving the fuel endurance in hours and minutes. P/ (PERSONS ON BOARD). Insert the total number of persons (passengers and crew) on board. Cross out “UHF” if frequency 243.0 MHz is not available. Cross out “VHF” frequency 121.5 MHz is not available. Cross out “ELBA” if emergency locator transmitter (ELT) is not available. Cross out “POLAR” if polar survival equipment is not carried. Cross out “DESERT” if desert survival equipment is not carried. Cross out “MARITIME” if maritime survival equipment is not carried. Cross out J if “JUNGLE” survival equipment is not carried. Cross out “LIGHT” if life jackets are not equipped with lights. Cross out “FLUORES” if life jackets are not equipped with fluorescein. Cross out “UHF” or “VHF” or both as in R/ above to indicate radio capability of jackets, if any. COLOR. Insert color of dinghies if carried. A/ (AIRCRAFT COLOR AND MARKINGS). Insert color of aircraft and significant markings. N/ (REMARKS). Cross out indicator N if no remarks, or indicate any other survival equipment carried and any other remarks regarding survival equipment. C/ (PILOT). Insert name of pilot-in-command. Pilots planning IFR flights to airports located in mountainous terrain are cautioned to consider the necessity for an alternate airport even when the forecast weather conditions would technically relieve them from the requirement to file one. The FAA has identified three possible situations where the failure to plan for an alternate airport when flying IFR to such a destination airport could result in a critical situation if the weather is less than forecast and sufficient fuel is not available to proceed to a suitable airport. An IFR flight to an airport where the Minimum Descent Altitudes (MDAs) or landing visibility minimums for all instrument approaches are higher than the forecast weather minimums specified in 14 CFR Section 91.167(b). For example, there are 3 high altitude airports in the U.S. with approved instrument approach procedures where all of the MDAs are greater than 2,000 feet and/or the landing visibility minimums are greater than 3 miles (Bishop, California; South Lake Tahoe, California; and Aspen-Pitkin Co./Sardy Field, Colorado). In the case of these airports, it is possible for a pilot to elect, on the basis of forecasts, not to carry sufficient fuel to get to an alternate when the ceiling and/or visibility is actually lower than that necessary to complete the approach. A small number of other airports in mountainous terrain have MDAs which are slightly (100 to 300 feet) below 2,000 feet AGL. In situations where there is an option as to whether to plan for an alternate, pilots should bear in mind that just a slight worsening of the weather conditions from those forecast could place the airport below the published IFR landing minimums. An IFR flight to an airport which requires special equipment; i.e., DME, glide slope, etc., in order to make the available approaches to the lowest minimums. Pilots should be aware that all other minimums on the approach charts may require weather conditions better than those specified in 14 CFR Section 91.167(b). An inflight equipment malfunction could result in the inability to comply with the published approach procedures or, again, in the position of having the airport below the published IFR landing minimums for all remaining instrument approach alternatives. When conducting flights, particularly extended flights, outside the U.S. and its territories, full account should be taken of the amount and quality of air navigation services available in the airspace to be traversed. Every effort should be made to secure information on the location and range of navigational aids, availability of communications and meteorological services, the provision of air traffic services, including alerting service, and the existence of search and rescue services. Pilots should remember that there is a need to continuously guard the VHF emergency frequency 121.5 MHz when on long over‐water flights, except when communications on other VHF channels, equipment limitations, or cockpit duties prevent simultaneous guarding of two channels. Guarding of 121.5 MHz is particularly critical when operating in proximity to Flight Information Region (FIR) boundaries, for example, operations on Route R220 between Anchorage and Tokyo, since it serves to facilitate communications with regard to aircraft which may experience in‐flight emergencies, communications, or navigational difficulties. ICAO Annex 10, Vol II, Paras 5.2.2.1.1.1 and 5.2.2.1.1.2. The filing of a flight plan, always good practice, takes on added significance for extended flights outside U.S. airspace and is, in fact, usually required by the laws of the countries being visited or overflown. It is also particularly important in the case of such flights that pilots leave a complete itinerary and schedule of the flight with someone directly concerned and keep that person advised of the flight's progress. If serious doubt arises as to the safety of the flight, that person should first contact the appropriate FSS. Round Robin Flight Plans to Mexico are not accepted. All pilots should review the foreign airspace and entry restrictions published in the appropriate Aeronautical Information Publication (AIP) during the flight planning process. Foreign airspace penetration without official authorization can involve both danger to the aircraft and the imposition of severe penalties and inconvenience to both passengers and crew. A flight plan on file with ATC authorities does not necessarily constitute the prior permission required by certain other authorities. The possibility of fatal consequences cannot be ignored in some areas of the world. Current NOTAMs for foreign locations must also be reviewed. The publication Notices to Airmen, Domestic/International, published biweekly, contains considerable information pertinent to foreign flight. For additional flight information at foreign locations, pilots should also review the FAA's Prohibitions, Restrictions, and Notices website at https://www.faa.gov/air_traffic/publications/us_restrictions/. When customs notification to foreign locations is required, it is the responsibility of the pilot to arrange for customs notification in a timely manner. Aircraft arriving to locations in U.S. territorial airspace must meet the entry requirements as described in AIM Section 6, National Security and Interception Procedures. In addition to altitude or flight level, destination and/or route changes, increasing or decreasing the speed of an aircraft constitutes a change in a flight plan. Therefore, at any time the average true airspeed at cruising altitude between reporting points varies or is expected to vary from that given in the flight plan by plus or minus 5 percent, or 10 knots, whichever is greater, ATC should be advised. All changes to existing flight plans should be completed more than 46 minutes prior to the proposed departure time. Changes must be made with the initial flight plan service provider. If the initial flight plan's service provider is unavailable, filers may contact an ATC facility or FSS to make the necessary revisions. Any revision 46 minutes or less from the proposed departure time must be coordinated through an ATC facility or FSS. To prevent computer saturation in the en route environment, parameters have been established to delete proposed departure flight plans which have not been activated. Most centers have this parameter set so as to delete these flight plans a minimum of 2 hours after the proposed departure time or Expect Departure Clearance Time (EDCT). To ensure that a flight plan remains active, pilots whose actual departure time will be delayed 2 hours or more beyond their filed departure time, are requested to notify ATC of their new proposed departure time. Due to traffic saturation, ATC personnel frequently will be unable to accept these revisions via radio. It is recommended that you forward these revisions to a flight plan service provider or FSS. A pilot is responsible for ensuring that his/her VFR or DVFR flight plan is canceled. You should close your flight plan with the nearest FSS, or if one is not available, you may request any ATC facility to relay your cancellation to the FSS. Control towers do not automatically close VFR or DVFR flight plans since they do not know if a particular VFR aircraft is on a flight plan. If you fail to report or cancel your flight plan within 1/2 hour after your ETA, search and rescue procedures are started. An IFR flight plan may be canceled at any time the flight is operating in VFR conditions outside Class A airspace by pilots stating “CANCEL MY IFR FLIGHT PLAN” to the controller or air/ground station with which they are communicating. Immediately after canceling an IFR flight plan, a pilot should take the necessary action to change to the appropriate air/ground frequency, VFR radar beacon code and VFR altitude or flight level. ATC separation and information services will be discontinued, including radar services (where applicable). Consequently, if the canceling flight desires VFR radar advisory service, the pilot must specifically request it. Pilots must be aware that other procedures may be applicable to a flight that cancels an IFR flight plan within an area where a special program, such as a designated TRSA, Class C airspace, or Class B airspace, has been established. If a DVFR flight plan requirement exists, the pilot is responsible for filing this flight plan to replace the canceled IFR flight plan. If a subsequent IFR operation becomes necessary, a new IFR flight plan must be filed and an ATC clearance obtained before operating in IFR conditions. If operating on an IFR flight plan to an airport with a functioning control tower, the flight plan is automatically closed upon landing. If operating on an IFR flight plan to an airport where there is no functioning control tower, the pilot must initiate cancellation of the IFR flight plan. This can be done after landing if there is a functioning FSS or other means of direct communications with ATC. In the event there is no FSS and/or air/ground communications with ATC is not possible below a certain altitude, the pilot should, weather conditions permitting, cancel the IFR flight plan while still airborne and able to communicate with ATC by radio. This will not only save the time and expense of canceling the flight plan by telephone but will quickly release the airspace for use by other aircraft. During the pre-flight planning phase the availability of the navigation infrastructure required for the intended operation, including any non-RNAV contingencies, must be confirmed for the period of intended operation. Availability of the onboard navigation equipment necessary for the route to be flown must be confirmed. If a pilot determines a specified RNP level cannot be achieved, revise the route or delay the operation until appropriate RNP level can be ensured. The onboard navigation database must be current and appropriate for the region of intended operation and must include the navigation aids, waypoints, and coded terminal airspace procedures for the departure, arrival and alternate airfields. During system initialization, pilots of aircraft equipped with a Flight Management System or other RNAV-certified system, must confirm that the navigation database is current, and verify that the aircraft position has been entered correctly. Flight crews should crosscheck the cleared flight plan against charts or other applicable resources, as well as the navigation system textual display and the aircraft map display. This process includes confirmation of the waypoints sequence, reasonableness of track angles and distances, any altitude or speed constraints, and identification of fly-by or fly-over waypoints. A procedure must not be used if validity of the navigation database is in doubt. Prior to commencing takeoff, the flight crew must verify that the RNAV system is operating correctly and the correct airport and runway data have been loaded. Operators not using model-specific software or FAA/VOLPE RAIM data will need FAA operational approval. If TSO-C145/C146 equipment is used to satisfy the RNAV and RNP requirement, the pilot/operator need not perform the prediction if WAAS coverage is confirmed to be available along the entire route of flight. Outside the U.S. or in areas where WAAS coverage is not available, operators using TSO-C145/C146 receivers are required to check GPS RAIM availability. Pilots should begin planning for operating into airports with cold temperatures during the preflight planning phase. Instrument approach charts will contain a snowflake symbol and a temperature when cold temperature correction must be applied. Pilots operating into airports requiring cold temperature corrections should request the lowest forecast temperature at the airport for departure and arrival times. If the temperature is forecast to be at or below any published cold temperature restriction, calculate an altitude correction for the appropriate segment(s) and/or review procedures for operating automatic cold temperature compensating systems, as applicable. The pilot is responsible to calculate and apply the corrections to the affected segment(s) when the actual reported temperature is at or below any published cold temperature restriction, or pilots with automatic cold temperature compensating systems must ensure the system is on and operating on each designated segment. Advise ATC when intending to apply cold temperature correction and of the amount of correction required on initial contact (or as soon as possible) for the intermediate segment and/or the published missed approach. This information is required for ATC to provide aircraft appropriate vertical separation between known traffic.